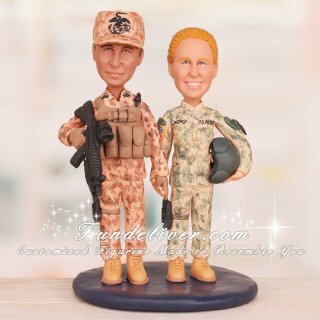 This is a completely customized Marine Corps and Army wedding cake topper ordered by one of our customers. The groom is a Marine Corps CPL (Corporal, E-4) and the bride is an Army 2LT (Second Lieutenant, O-1). They would like the groom to be in his Desert digital camouflage uniform with the plate carrier shown as above picture and a rifle slung in front like he is carrying it on his right side. 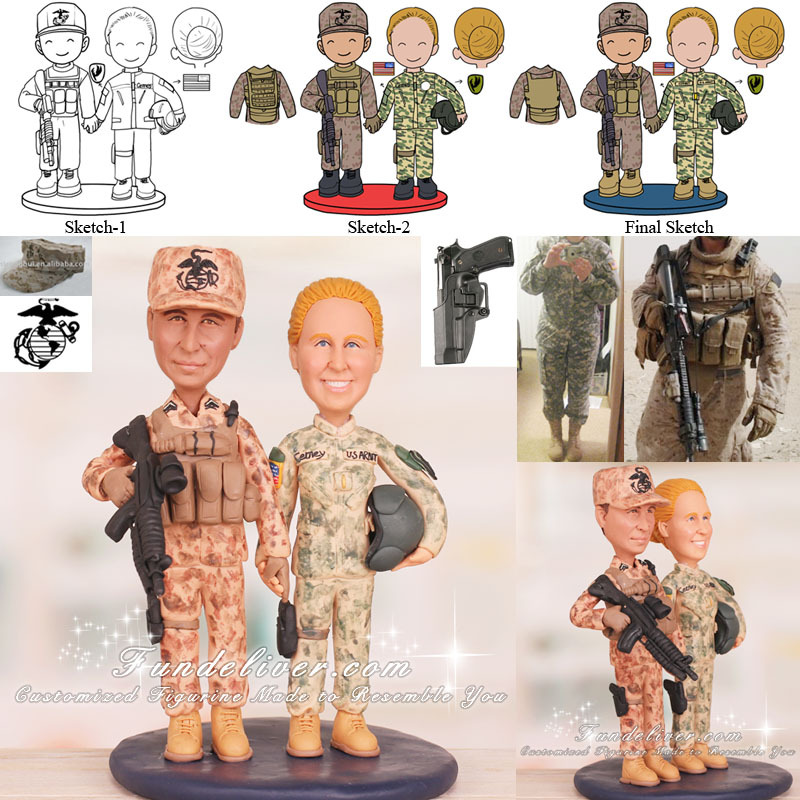 However, instead of the helmet and glasses in Desert digital arming, they would like him in the standard octagon hat with the Marine Corps emblem on the front center. He is also having the M9 pistol strapped to his right leg. His rank is on the corners of his collar on both sides. For the bride, they would like her to be in the Army A2CU (the new flight suit) uniform. There are some differences with that uniform from the standard ACU uniform. Please check above image for detail. They would like her hair in a bun with no hat and to have the flight helmet under her left arm. She hasn’t a rifle, since she is holding the groom’s hand, but has the M9 pistol on her right leg.